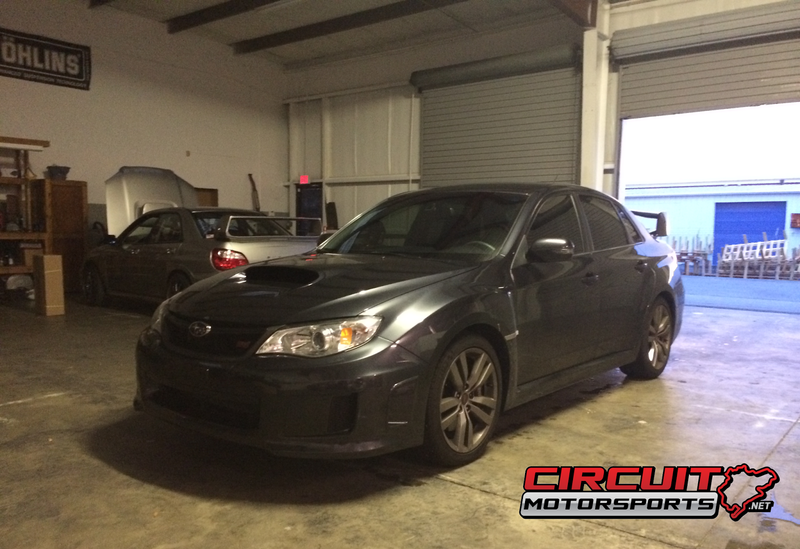 Circuit Motorsports: Flat-Out: 2012 STI Sedan with Blouch 18g XTR Turbo Tuned! 2012 STI Sedan with Blouch 18g XTR Turbo Tuned! We recently tuned this customers 2012 STI Sedan with a Blouch 18g XTR, after the dyno rollers stopped we had achieved over 365whp/400wtq! This particular customer had traveled a rocky road before coming to us for a tune. The car had previously been tuned by another shop in town and after a week the motor blew. The customer had the engine rebuilt using forged Wiseco pistons and decided he wanted us to tune it for him and see what we could do. 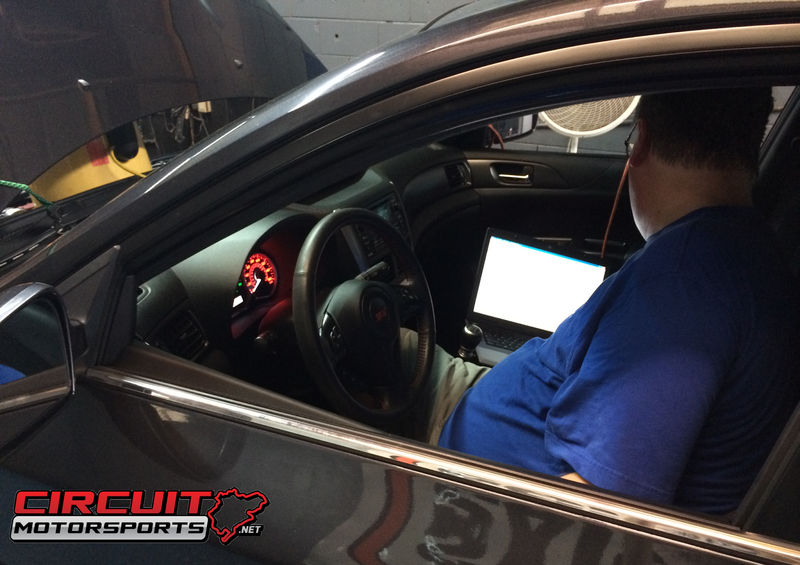 We suggested installing the Cobb Fuel fix as the car was suffering badly from the issue with the stock Subaru fuel system, causing a fuel surge and a dangerous lean condition under High load throttle at low RPM's. With our tuning and the Fix installed we can completely eliminate this issue. We also smoke leak tested the car to make sure there were no leaks prior to tuning. The 18g performed better then we expected, providing quick spool up and a really nice set of numbers. Power is right around the 365/395 range, but we did get over 400 ft/lbs. of torque to the wheels on a couple runs! The car feels great, as the graph shows torque comes on strong very early and stays pretty flat. Horsepower builds quickly and holds strong almost all the way to redline. This graph shows 3 back to back runs, heat affects the graph on each consecutive run, but you can see the consistency there! 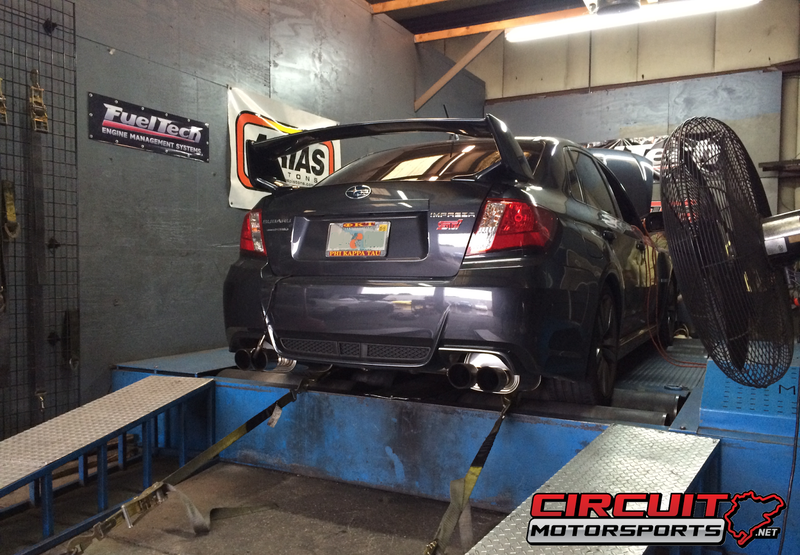 Circuit Motorsports is a professional tuning and performance shop in Orlando, FL. We specialize in Subarus, tuning, builds and awesomeness.